From the 1930s through the 1980s, Vincent Price was an incredibly prolific actor, best known for his distinctively spooky voice, and his performances in a range of classic (and not-so-classic) horror movies. Price appeared in everything from the original versions of House on Haunted Hill (1959), The Fly (1958), and House of Wax (1953) to 1959’s campy The Tingler, a novelty 3D movie in which theatergoers’ seats vibrated at scary moments throughout the film. His final on-film performance was in Tim Burton’s Edward Scissorhands (1990). But the horror legend didn’t just appear in movies—Price was also a prolific commercial actor. In the ‘70s and ‘80s, Price lent his image or voice to ads for wine coolers, board games, candy bars, and even the American Dairy Association. Full of haunted mansions, spooky music, and terrifying wordplay (“prices that won’t scare you!”), most of the commercials put Price’s horror pedigree front and center. Check out 10 of our favorites. “It’s alive!” The mildew, that is. 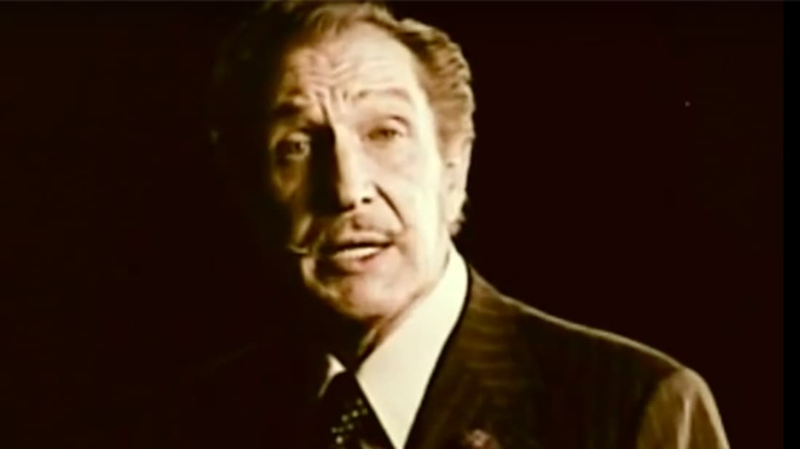 Fortunately, Vincent Price has the solution: Tilex instant mildew remover! It’ll rid your haunted mansion of even the most resilient mildews. This 1979 ad for antique furniture packs an impressive number of spooky jokes into just 30 seconds of airtime. Another haunted house commercial from 1984—this time for a hauntingly old-school product: videocassettes that clean your VCR as they play. The all peanut butter “Peanut Butter With No Jelly” candy bar improved upon the classic PB&J by removing extraneous ingredients like bread and jelly. In 1985, a company called Sun Country inexplicably decided to put Vincent Price in a polar bear costume and then play some old fashioned haunted house music to sell their wine coolers. Once again appearing in a spooky mansion, with spooky music in the background, Price advertises a not-particularly-spooky series of myths and legends for Time Life Books in this 1985 commercial. The “safe,” “fun” alternative to giving out actual candy on Halloween, the coupons are a worried parent’s dream. Price lent his voice to this mysterious cookie commercial. Price appeared in this dairy commercial in 1982, warning consumers against “false” dairy products, and reminding them to look for the official “American Dairy Association” seal.